The olives are immediately, after each harvest, crushed in a mill in the Alpes de Haute Provence certified for organic farming (organic approval). The olives are cold pressed by mechanical means, thus ensuring that the nutritional qualities of a healthy and natural olive oil are maintained. 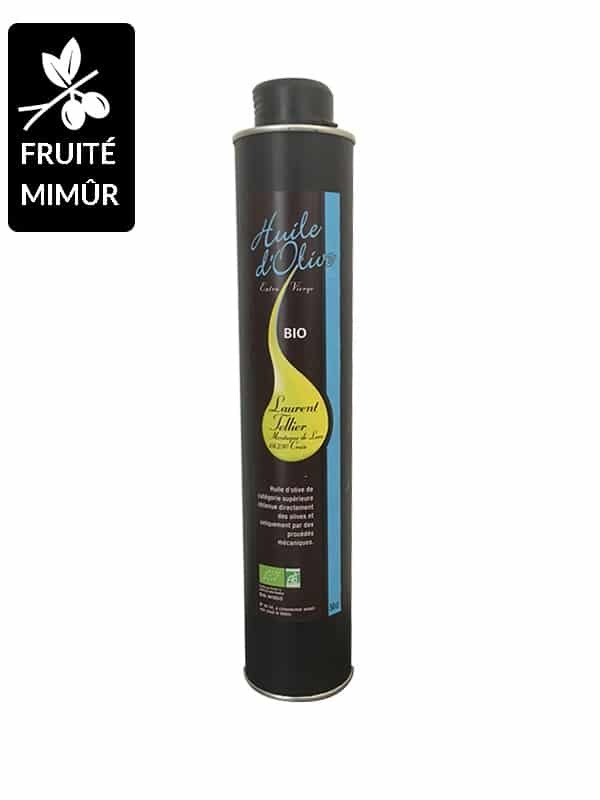 Organic extra virgin olive oil from Haute Provence, fruity green with an intense taste, is smooth and particularly fruity with aromas of artichoke, banana, apple, pear, hay and almond. 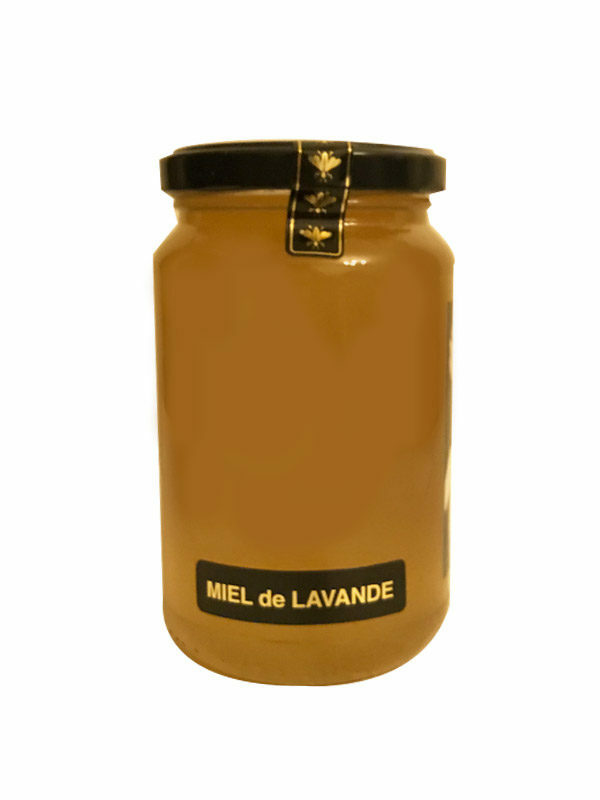 The extra virgin olive oil of Haute Provence Organic with medium ripe fruit, sweet and subtle taste is sweet and fine. This organic olive oil from France is incredibly rich in aromas, mainly floral and cut hay. The Olive grove Les Olivettes de Lure of Laurent Tellier is located at Cruis, a small village of Alpes de Haute Provence (France). In the middle of lavenders and of the the scrublan, Laurent has began his olive trees planting in 1999. 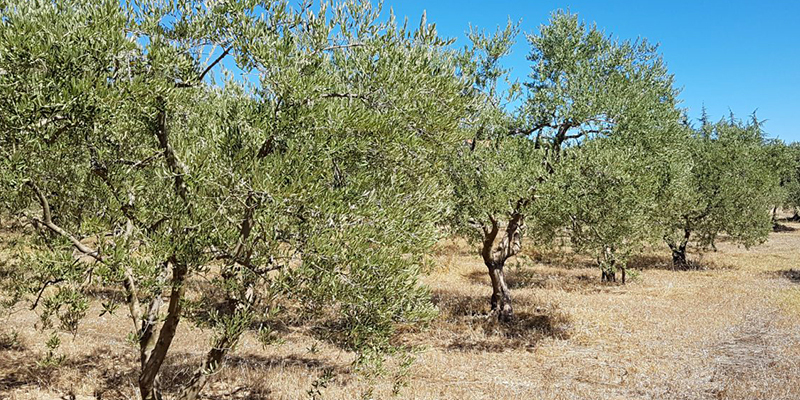 With a modest size, the altitude olive grove is characterized by a 100% organic agriculture and by a olive oil of exceptional quality. At an altitude of 800m is the olive grove Les Olivettes de Lure by Laurent Tellier. 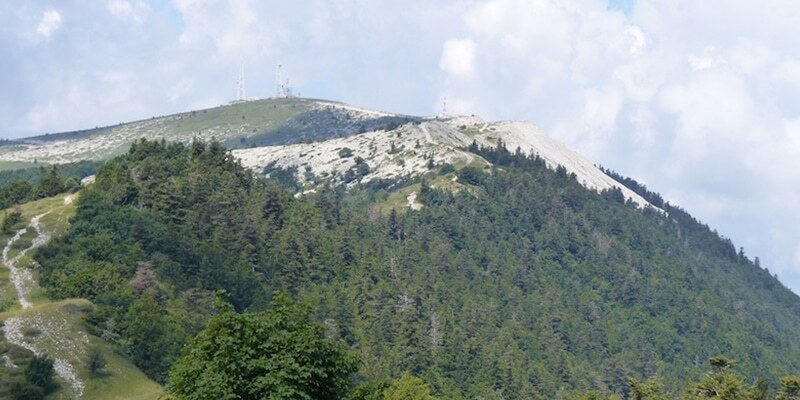 It is in Cruis, in the heart of the Alpes de Haute Provence, that you can discover olive trees that are unique in France. Acclimatized to the altitude, Laurent Tellier’s olive trees produce a rare olive oil. In 1999, Laurent planted his first olive trees on the slopes of the Lure mountain, amid lavender and medicinal plants. He now devotes himself to the production of an organic extra virgin olive oil from Haute Provence with aromas marked by the lavender he also cultivates. Laurent Tellier’s olive oils have a great taste. 100% organic, labelled AB certified European regulation, they come from an olive tree culture without any pesticides. 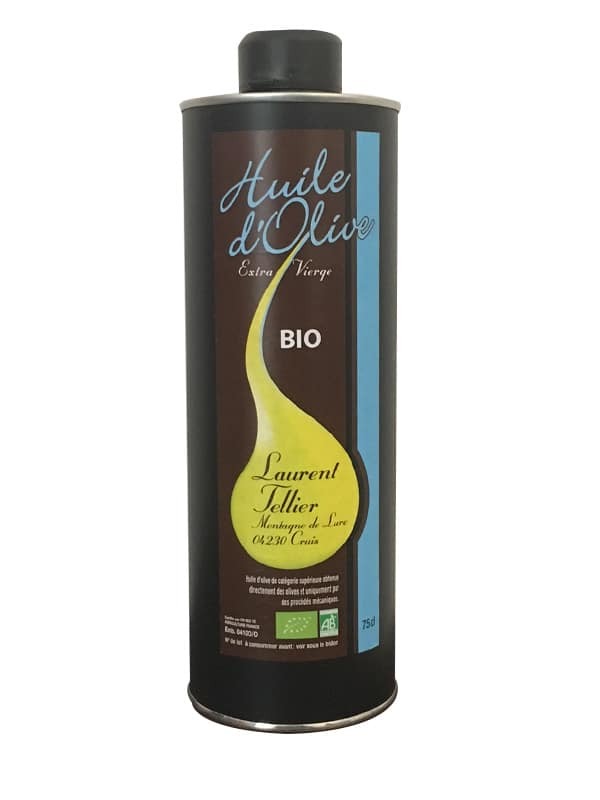 Laurent Tellier’s organic extra virgin Haute Provence olive oils are made from the Aglandau variety. Aglandau produces an olive oil with a very good structure, rich in aromas and high unctuousness. The Aglandau is well resistant to frost and the altitude of Laurent Tellier’s olive grove because of its low water content. Made from organic farming, the extra virgin olive oil from Haute Provence produced by Laurent Tellier is of exceptional quality. Its fruity, smoothness and total absence of pesticides will be appreciated by all those who are looking for a 100% organic local olive oil. This healthy and natural organic olive oil has all the beneficial properties for health: oleic acid, monounsaturated fatty acids, total presence of vitamins and omegas. Aglandau : Very pronounced in vegetal fruity. The olive oil is fiery with a light bitterness. It gives a strong character at the olive oil. Organic extra virgin olive oil from Haute Provence, fruity and intense green, is characterized by powerful aromas. Smooth and particularly fruity, this olive oil initially envelops the palate in sweetness. Then it surprises by its ardour and its slight bitterness which awakens the taste buds. Excellent olive oil to keep, it will keep all its character for 18 months. 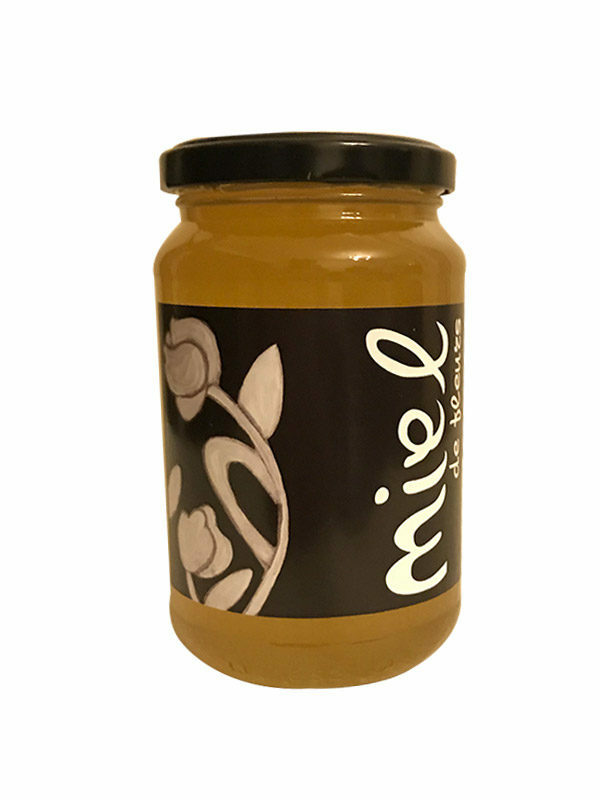 With its aromas of artichoke, banana, apple, pear, hay and almond and its slightly peppery note, this organic olive oil is recommended for all raw and cooked salads and vegetables. Without vinegar and salt, this organic olive oil from France with its intense green fruitiness will delight even the most tasteless dishes. 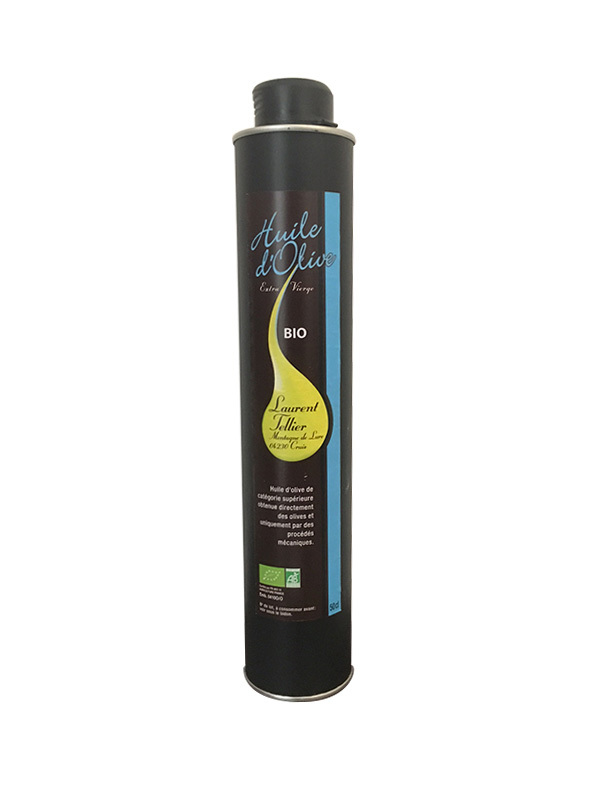 Organic extra virgin olive oil with a medium fruity taste and a sweet and subtle taste is suitable for fish, white meat, poultry, starchy foods, fresh pasta and risottos. It can be used as a dessert on fresh fruit cups. It will be fabulous on pineapple roasted with spices. 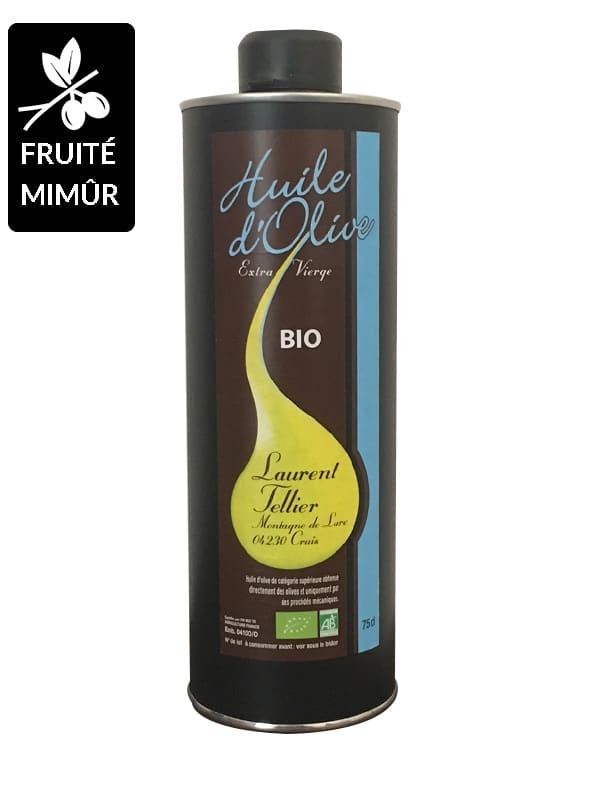 Find the position of the producer who joins the Compagnie de l’Huile d’Olive..